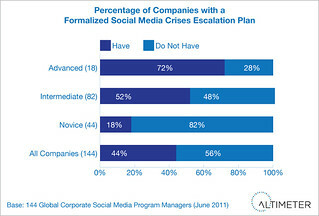 Left: Altimeter’s Research found that social business maturity and crises preparedness are heavily correlated, and on average, most companies are not prepared. Just as airlines, naval craft, and spacecraft prepare for disaster recovery and risk mitigation, today’s leading companies must do the same with social. Altimeter has conducted research on this topic read report by Alan Webber on Guarding the Gates, and Social Readiness to obtain industry level insights and pragmatic recommendations, this is our continued coverage on this topic, especially after crises at Progressive this past week. One of my most popular research projects for brand side clients is conducting a readiness assessment of their social business. 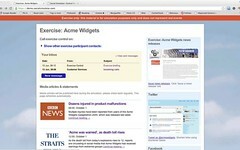 Using a 50+ checklist we spend time with stakeholders to find out exactly ‘how ready’ are companies for social business. Often, I find that companies do have triage plans in place for everyday workflow –but are woefully unprepared for crises. We found in our research that companies that are advanced are actively conducting private fire drills for social media crises, both internally and working with third party agencies and software providers. While not an extensive list, feel free to leave a comment below if you’ve a simulation that can help brands not be caught off guard. We interviewed Weber for previous research reports to find out they have a dedicated practice to deal with Social Media Crises, which they list on their page. They created a private software tool that can be used by brands and agency partners to conduct a simulated crises even compressing a multi day attack into a few hours. I’ve met the community manager team at an offsite in SF last year and was pleased to see how they were planning and training this service line. Learn more from their PDF on Firebell solution. I used Twitter to source names of providers, and also heard from Say It Social, a small team who spans client based in CPG, Retail, Regulated and more. 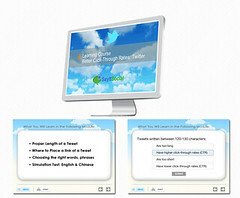 Although they offer a broad range of services beyond crises, they offer Social Media crisis simulations through their elearning LMS with scoring, testing for enterprise, global teams. Their eLearning page indicates that they: “Use real-life simulation models to test employee social media knowledge & hone employee social media skills”. They also offer a number of auditing tools that look at risk and compliance. In the end, companies must be prepared for crises as we’ve found the frequency is only increasing. Yet don’t focus on providers because of their software alone; seek providers that have a proven method based on analyzing previous crises, and have learnings both post event and ways to improve the process. I encourage clients to practice for a crises that starts on a Friday evening before a three day weekend when executives are not available, and a product or service has caused harm to a customer and it’s rapidly spreading through social media channels. Like all sophisticated companies, they’re ready for a number of crises and disaster recovery, and now it must extend to social channels. If you know of a software or service provider focused on this topic, please leave a comment below.